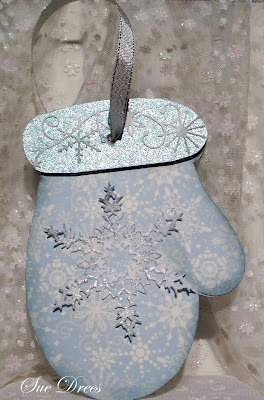 I made this gift tag by tracing the mitten from one of those large foam stamps. You could also use a coloring book with large images, google mitten shape and see what you get, might find something that way too. The snowflake paper is DCWV Winter Magic Stack. Both the snowflake border and the Snowflake are die cuts from Memory Box. I sponged the edges with Ranger distress Iced Spruce (limited edition Christmas colors (3) and they are NOT making reinkers for them! 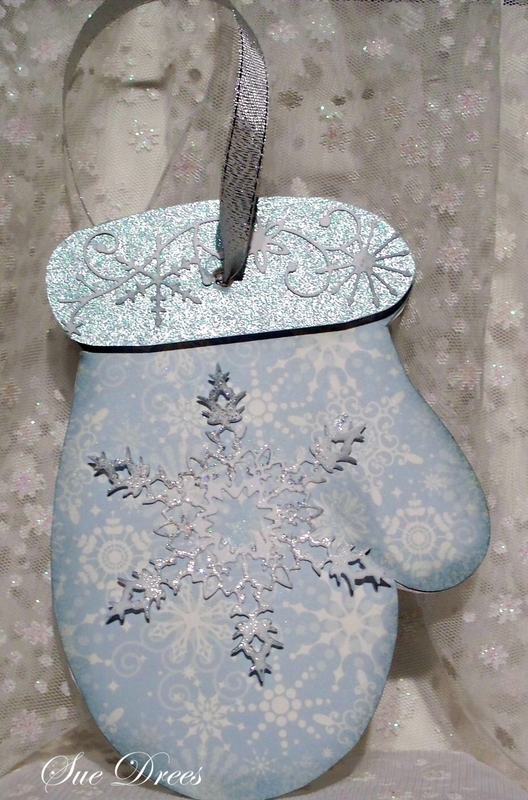 I made the back of the mitten a pearl blue matching paper and stamped Merry Christmas and To and From with Versafine watermark ink and embossed in white. Silver ribbon for attaching to a gift. You could easily make this a gift card Holder. 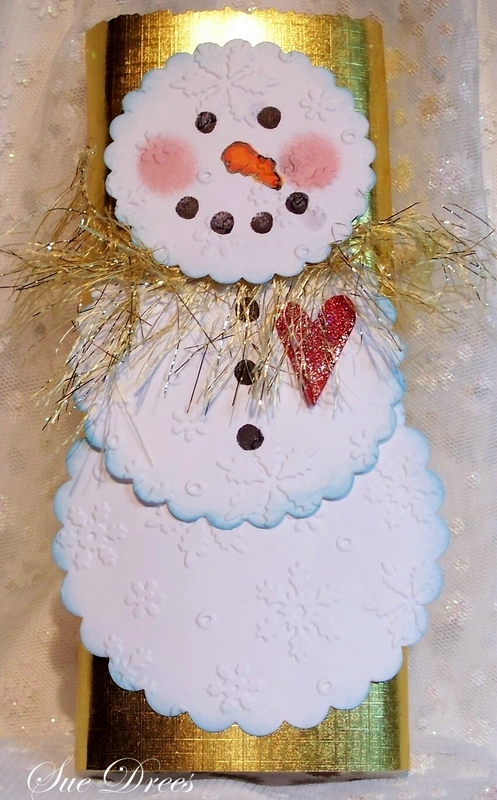 This delightful little snowman is a candy bar wrapper. I measured the candy bar and cut a piece of gold paper to wrap around the bar. I trimmed the top with decorative scissors. The three circles were cut with Marvey punches, but you could just make different sized circles with die cuts or trace anything that is round and cut out. The faces were made by adding eyes and mouth and button with a pencil eraser, just use the eraser end of a pencil like a stamp. The carrot nose was hand drawn and colored with Copics. I ran the circles through a snowflake embossing folder (Darice), sponged the edges with Broken China distress ink (Ranger). Cheeks sponged with pink ink. Added a punched elongated heart from glitter paper and some eyelash gold yarn for his scarf. I am making 20 of these for my daughter's first grade class for Christmas. Love both of these ideas. That snowman is so adorable. I know what you mean about not getting things done now when you are home. It seem each year just flys by. Have the same problem with buying this year too:) Think that is a universal problem? Ha ha, I have the same problem! How did I ever find time to work full time??? Love your projects today - as always, your work makes me smile! Thanks for sharing - hope you are doing well! Sue I love both of these today. That mitten is just so cute and I love those die cuts you used. That shade of blue is gorgeous. The candy wrapper is adorable. It's bad enough that I like the candy without any special wrappers, but when it looks this cute I certainly have to have it. I know what you mean about not having time. This week alone I've already been tolunch three times with different friends. That shot three days of working in the house or crafting. I wanted to tell you that I did end up posting the HM card yesterday. It's only somewhat of what I had pictured in my head, but I guess it's better than nothing. Have a great night. Fun winter projects! You are such a good MOM! both ideas are great and you made each piece so beautiful! Have a nice weekend Sue! Sue, I love your blog! Wow! I really love your snowman creation - impressive1!!!!! Fantastic projects Sue, the mitten is beautiful and the snow man is so cute, they are both very inspiring. Both of these are so cute Sue and great ideas. I love the snowman candy wrapper. I am with you-I am so behind this year. I put up my decorations this weekend and only 1/10 of what I normally put up. Instead of 5 trees I have 2...lol Getting sick at Halloween really put me behind. I am just now back to normal. My boys are 19 and 25 so most of the shopping is being done on the internet. Wishing you lots of energy and quiet time to prepare for your festivities.